After two days of semifinals and finals concerts at the University of Michigan, the Calidore String Quartet has won the $100,000 M-Prize, a new chamber music competition hosted by the U-M School of Music, Theatre & Dance. 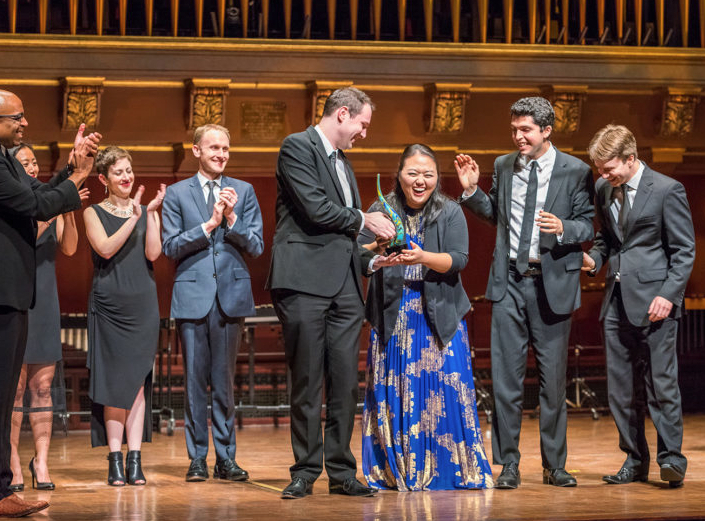 The announcement was made Thursday night at Hill Auditorium after the grand prize gala competition, which also featured senior “open” division winners Yarn/Wire, and senior winds division winners, the Kenari Quartet. The Calidore String Quartet, an ensemble from New York City, is the 2016 Borletti-Butoni Trust Fellowship recipient, the first American ensemble in the foundation’s history to receive the prestigious career grant. The quartet members—Jeff Myers and Ryan Meehan (violins), Jeremy Berry (viola) and Estelle Choi (cello)—are currently artists-in-residence and visiting faculty at Stony Brook University-New York. They were appointed to the Chamber Music Society of Lincoln Center Two roster for the 2016-19 seasons.